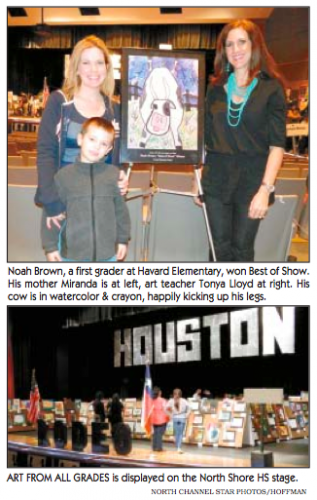 Hundreds of students, parents, art lovers and art teachers turned out last Thursday, Jan. 16 at the North Shore High School, for a large display of award winning Rodeo and western art from all the grades in the district. 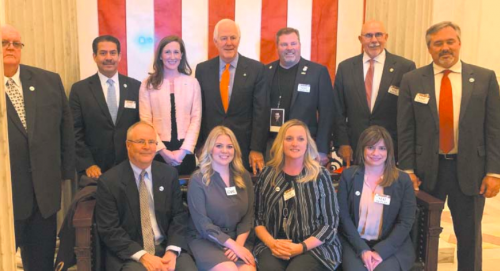 The prize winners will be sent to the Houston Livestock Show & Rodeo art judging, for possible additional prizes and a chance to be auctioned for scholarship money. Sam Harris, Director of GP Fine Arts programs, explained how teachers worked with the students over a period of time, sketching, giving them examples and photos to work from, and helping them with their techniques and mediums. the results could only be described as very high quality artworks. As an example, teacher Tonya Lloyd, who’s student Noah Brown won Best of Show for elementary students in the whole district, spent weeks on this project with Noah and the other students, drawing examples on the whiteboard in the classroom, showing videos, choosing photos to work from, and studying shapes and mediums. The students gradually built up an understanding not only of the visual example, but also the meaning behind the subject in the artwork. They also learned through various study techniques how to use the different mediums, such as pencil, crayon, and watercolors, so achieve their results.